There’s no such thing as a free lunch guide. The world is wise to us marketers. They know we’re giving away that gated content in hopes of getting them on the path to spending money with us. The bar for gated content is only getting higher. Which means we need to make sure the content we give away is irresistible. But what kind of lead-generation content actually resonates? To find the answer, we took a look at HubSpot’s lead-generation offers in 2017. HubSpot’s product and philosophy revolve around attracting people to your website and converting them to leads and customers via content. So if we want to know what kind of gated content works, who better to analyze than HubSpot? So we analyzed 130 landing pages in HubSpot’s resource library to see what we could learn from their best gated content. I’ve distilled all this into 7 takeaways for creating content that actually generates leads. The top ten lead magnets account for 77% of those shares. Let’s take a look at the most popular pieces, then jump into what we can learn from them. Share counts are rounded to the nearest ten. A live online event (now available on demand) produced in partnership with Facebook and Gary Vaynerchuk. This was HubSpot’s most successful lead generation campaign of all time. Another webcast (now available on demand) covering some significant shifts in the way HubSpot recommends tackling content strategy. HubSpot partnered with Ryte to make this free 57-page introduction to SEO, how it works, and how to start showing up in search engines. A 23-page list of SEO misconceptions that have either become obsolete or been wrong all along. A bundle of Powerpoint and Illustrator files that marketers can use to create their own infographics. Created in partnership with SocialBakers, 31 pages identifying 24 misconceptions about Facebook as a social network and marketing platform. A 21-slide PowerPoint template for preparing competitive analyses, plus a 27-page PDF guide to walk you through the process of performing one. HubSpot partnered with Alexa on this one. 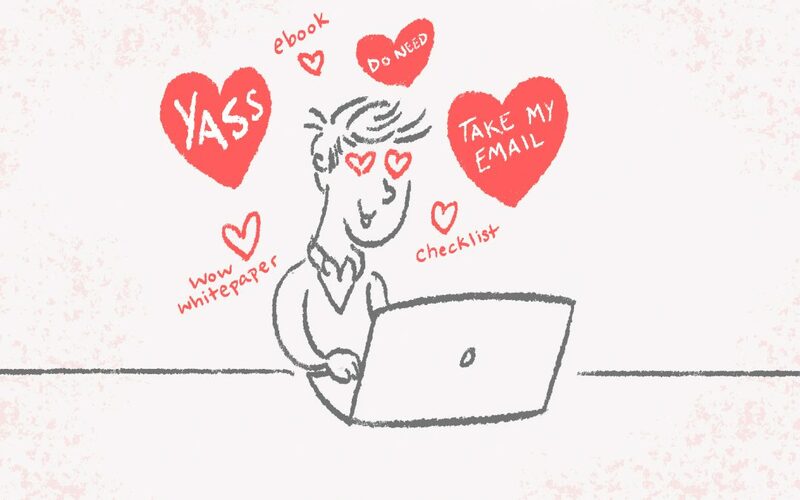 A 38-page guide to creating emails plus a haul of 45 HTML email templates. HubSpot partnered with 99designs on this. A 15-page guide to writing proposals, plus a sample proposal that a HubSpot partner agency uses. HubSpot practices what they preach (both when it comes to lead magnets and their blog) and they preach to organizations of all sizes (mostly SMBs). That means no matter what industry you’re in, no matter how big or small your marketing team may be, you can learn something from HubSpot. So, what can we learn from their lead magnets? We took a closer look at each of these resources (and their landing pages) and found seven takeaways you can use in any industry. Change is inevitable, even if you’re marketing to a particularly ponderous industry. Three of HubSpot’s lead magnets capitalize on changes that have happened in the digital marketing world. The New Age of SEO explains how Google’s algorithms are moving away from focusing on long-tail keywords at the page level to focusing on higher-level topics at the “cluster” level. For many marketers, this represents a continental shift in how they think about SEO. Either way, HubSpot’s working change to their advantage by helping their market navigate new territory. What has changed in our industry in the past six months? How should our audience adjust and adapt? What are some things our audience believes that are no longer true? How can we help them understand the new status quo? Teach a man to fish and then give him a 100-piece tackle kit? That lifetime of being fed begins a lot sooner. You get the idea. For some of HubSpot’s strongest content, the value is in doing the grunt work for the lead. By the way, free templates are an SEO goldmine for HubSpot. HubSpot drives a lot of traffic to their landing pages from blog posts, email, partnership promotions, and ads. But some of these landing pages get some traffic from search engines, too. And according to Ahrefs, about 58% of HubSpot’s organic traffic goes to their free template landing pages. Oldies-but-goodies like their editorial calendar, persona, blog post, and marketing budget templates continue to rake in leads for them. Usually these are mind-numbing chores. You can probably come up with 3–10 of these documents your audience needs to create every week, month, or year. And then you can handle 80% of the work for them by setting them up to tweak it to their own needs. Just remember to include some form of framing and guidance so that anyone who downloads your templates can easily start using them. A PDF guide that walks people through the process doesn’t hurt. As long as people have to do stuff, they’ll need to know how to do stuff. That’s why how-to ebooks have enjoyed so much staying power in the world of lead magnets. And they’re still dominating HubSpot’s top lead generation content. It’s tempting to turn a “how-to” piece into a sales pitch. You need to resist that urge at the top-of-funnel stage. People value these how-to guides because they’re immediately useful. You don’t need a HubSpot or Alexa subscription to do a competitive analysis. The guide in their Competitive Analysis Kit stands on its own. That’s why these landing pages get so many shares. They’re not long-form infomercials. They’re helpful guides focused on winning the reader’s trust by giving them something helpful. Your sales pitch can come after they’ve enjoyed your content. That’s what you needed their contact info for in the first place, right? Six of HubSpot’s top 10 lead magnets are collaborative. They partnered with big-time influencers like Gary Vaynerchuk and giants like Facebook. But they also partnered with smaller organizations like Piktochart. This is relatively common for HubSpot. In fact, as you go through some of their other prize-performing content, you’ll find partnerships with Wistia, Venngage, Heather Morgan Terminus, Chatfuel, Prezi … the list runs long. They don’t have to make the content all by themselves. There’s a built-in extra audience (the partner’s) that’s going to hear about each new content offering. They get inbound links from the partner websites. Make a list of non-competitive companies and influencers in your industry. Make a list of problems that your audiences share, and discuss opportunities to partner together. Find a way to make both of your audiences’ lives better. It might be a collaborative webinar, or a free guide, or even some templates. You’ll notice something else: these aren’t small lists. In fact, they’re all double-digits. This doesn’t mean bigger lists are intrinsically more valuable. A list of 100 crappy tips is less valuable than one piece of stellar advice. But if you’re trying to get an email address with a list, try to gather a valuable amount of list items. For example, let’s say you’re a marketing manager and you want to help your team understand how SEO works in 2018. You could spend two days hunting down the misconceptions they should unlearn. Or you could just let HubSpot do it for you. They’ve already put together a list of 20 SEO myths. You can sign up, skim the ebook, and forward it to your team in less than 10 minutes. That’s about 16 hours of work saved, in exchange for an email address and some company info. On the other hand, it’s not worth your time to download a list of 4 SEO changes. You can come up with four changes to SEO off the top of your head right now. If you can do the dirty work of curating a massive list of tactics, tips, and examples for your audience, they’re much more likely to give you their information. It’s easy to set a double-digit rule. Coming up with 10+ ideas every time? Not so easy. Find lists within your list items. Don’t be afraid to turn “5a,” “5b,” and “5c” into “5,” “6,” and “7.” Just throw an umbrella category over the three. Don’t cheat on this—each item still needs to be valuable on its own. Be a detective: ask who, what, where, when, why, and how. Who should implement these changes? When do these changes need to happen? Where do these changed rank in your readers’ priorities? Obviously, don’t make stuff up. If you’re researching something and find seven trends, don’t invent three more. Four Days of Facebook was the best lead acquisition campaign in HubSpot’s history. But it wouldn’t have happened if the HubSpot team hadn’t taken the risk of reducing their campaign frequency. In early 2017, HubSpot’s co-marketing team would churn out about 15–20 new campaigns every quarter. But this time, they chose to devote the efforts of five regular campaigns into one big one. Tenfold results from fivefold effort. Wow! Lead magnets are usually in written or designed form. But video content can be an effective lead magnet, too. And it doesn’t have to be the typical demo webinar. HubSpot’s two most popular lead magnets of 2017 were videos. And both were momentous video occasions. One was done in partnership with one of the most prominent companies in the world. The other was about HubSpot’s massive shift in recommended SEO strategy. When you’re considering content formats, don’t limit yourself to ebooks and templates. Video content can be even more powerful for the right messages. And if you do use live video, make it available on demand afterward as a lead magnet. The Four Days of Facebook landing page got even more shares after the event than it did when registration was open! 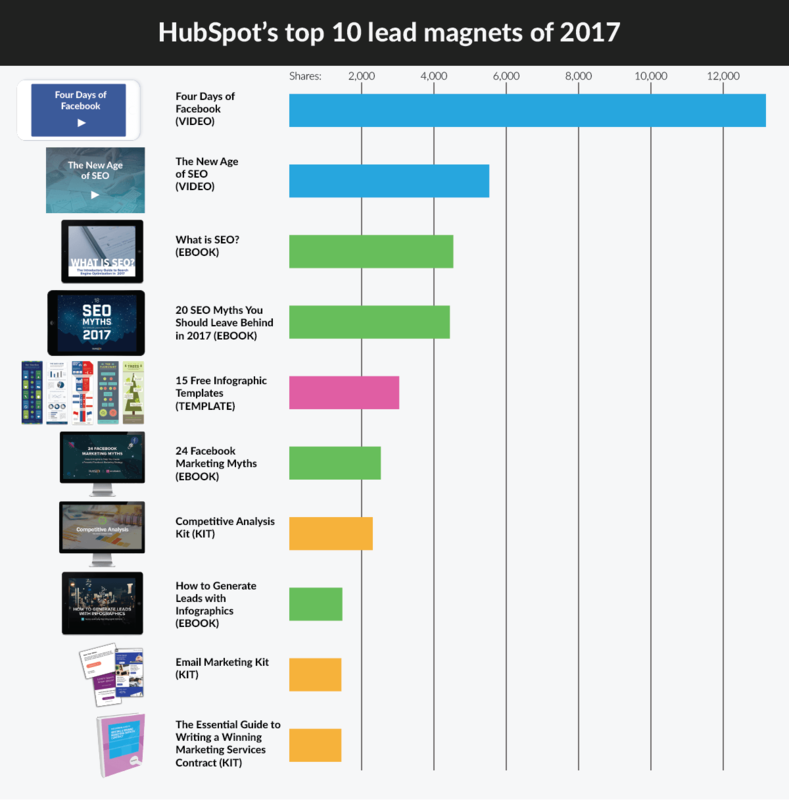 HubSpot published some killer lead magnets in 2017. You don’t need to be a $300MM SaaS company to do the same this year. Start by identifying the topics your audience wants help with. Are they frustrated making the same old documents month in and month out? Give them a free template. Are they expected to get the hang of a new tool or trend? Give them a how-to guide. Do they need to navigate a big shift in their industry? Give them a book of myths to dispel. Are they anticipating something big on the horizon? Host a live video. Then build partnerships with other companies, and see how you can help their customers, too. Make every piece of content you give away so valuable that the people downloading it feel guilty if they don’t pass it on. And watch the leads pour in.